Can A Republican Win A Senate Seat In Blue Hawaii? 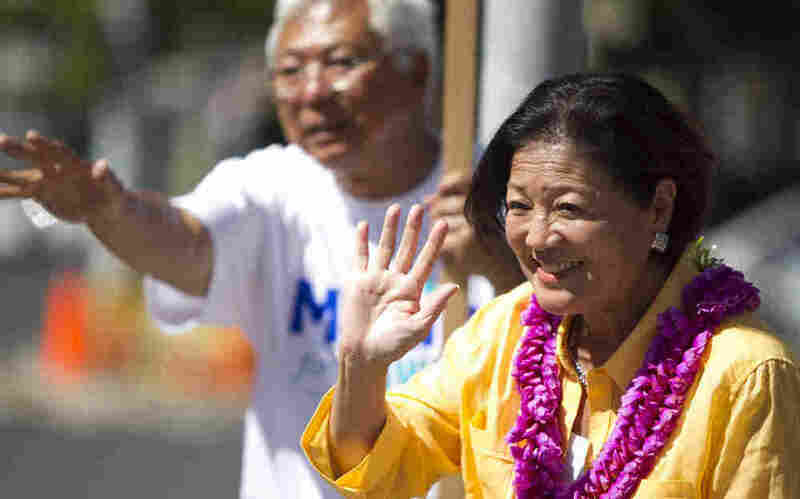 : It's All Politics Surprisingly, some analysts are putting Hawaii's Senate race in the tossup column this year. Hawaii hasn't elected a Republican to the Senate since 1970. But with former Gov. Linda Lingle running, Republicans believe they have a chance. And whoever wins, the state will have its first female senator. Can A Republican Win A Senate Seat In Blue Hawaii? Former Hawaii Gov. 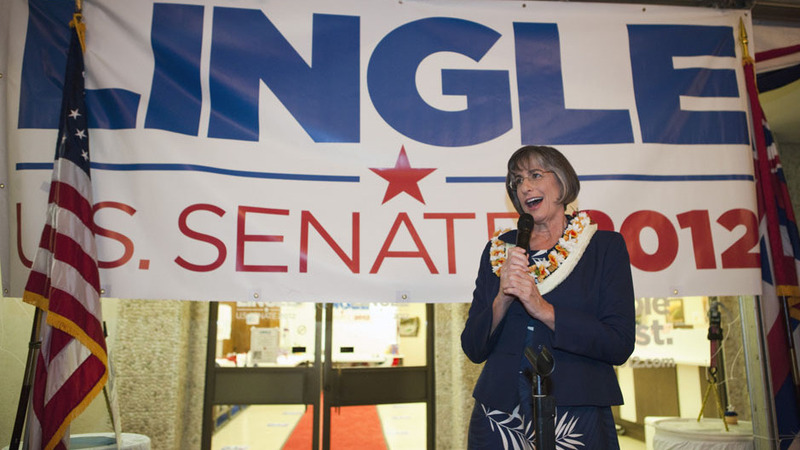 Linda Lingle gives a victory speech in Honolulu after winning the Republican nomination for U.S. Senate on Aug. 11. Republican hopes of capturing the Senate in November rest on a handful of tossup races in states like Montana, Missouri and Virginia. Surprisingly, some analysts also are putting Hawaii in the tossup column. Hawaii is the bluest of blue states; it hasn't elected a Republican to the Senate since 1970. But with the retirement of 22-year incumbent Daniel Akaka, Republicans believe they have a chance. And regardless of who wins, the state will have its first female senator come January. In Hawaii, the language of politics is a little different. Take for example Senate candidate and U.S. Rep. Mazie Hirono delivering her version of the customary Democratic talking points: "Our next United States senator should share our values. Those are the values of protecting our kupuna — why I am such a strong voice for making sure that Social Security and Medicare remain strong for our kupuna. We need to protect our keiki." Keiki means "children." Kupuna, as you may guess from the context, means "elders" — or in this case, seniors, who vote. Hirono's opponent for the Senate seat, former Gov. Linda Lingle, also uses some unusual vocabulary — especially when describing herself: "A haole, Republican, Jewish woman from the mainland!" Haoles — or whites — are a minority in Hawaii, as are Republicans. So it was quite the upset when Lingle beat Hirono in the governor's race in 2002. Lingle says the state's voters are capable of crossing the partisan divide. "They elected me and re-elected me with the largest margin in state history as a Republican. They know I'm a Republican, but they know I also put people first," she says. "So what does it mean in Hawaii to be a Republican? It means I'm a fiscal conservative, I'm a strong supporter of our military, but I'm also pro-choice. I'm a Hawaii Republican. I'm not a national Republican." Hirono, on the other hand, likes to refer to Lingle as "the Republicans' top draft pick" for this race, and she constantly reminds Hawaii voters of the math in the Senate. Democratic Rep. Mazie Hirono campaigns in Honolulu on Aug. 11. "Regardless of how people feel about Linda Lingle, she is going to be one of the votes that the Republicans need nationally to totally take control over the U.S. Senate and push their agenda," Hirono says. Hirono warns that a Lingle win would mean one more vote in the Senate to repeal President Obama's health care law. Asked if that's true, Lingle dismisses it as a "campaign question." She says she likes certain aspects of the law, but if she were presented with a simple choice of keeping or repealing the whole law, she'd get rid of it. "If we're going to keep everything that's in there now or not, I would not support this," she says, but she insists it won't come to that. "I don't believe that will ever be the only question," Lingle says. "I'm a serious person; this is a serious issue. I think we need to approach it in a serious way, even though we're in campaign season." The fact that a Republican is this reluctant to talk about repealing the president's health care law speaks volumes about Hawaii. Dan Boylan, a history professor and liberal political columnist, says locals still have great pride in their native-son president, and they think he's been treated shabbily by mainland Republicans. "They resent very much this 'birther' aspect of the Republican Party or the Tea Party movement or the crazies, whoever they are, who keep questioning ... where Barack Obama was born. We know where he was born," Boylan says. So Democratic turnout will be big, he says. Lingle's challenge is to convince some of the president's supporters to split their ballots. "If any Republican can get elected to the Senate from this state, Linda Lingle can do it," Boylan says. Lingle does appear to have an edge when it comes to money, and she benefits from third-party advertising by the U.S. Chamber of Commerce. So far, the few public polls give a significant edge to the Democrat. But the ad war is just warming up, and there's an expectation in Hawaii that voter preferences won't firm up until next month, when the candidates are scheduled for a series of televised debates.